If this card is Normal or Special Summoned: You can take 1 Dinosaur-Type monster from your Deck, and either add it to your hand or send it to the Graveyard. You can target 1 other Level 4 or lower Dinosaur-Type monster on the field; destroy it, then Special Summon 1 Dinosaur-Type monster from your Graveyard in Defense Position. You can only use each effect of "Souleating Oviraptor" once per turn. This monster is based on the Oviraptor. The enlarged, dome-like skull also makes it resemble the Pachycephalosaurus. Oviraptors were predators of eggs, and this monster's effect was designed to work best by destroying Jurraegg Tokens, Babycerasaurus and Petiteranodon in reference to that. Given this card's malicious connotation, it may also be inspired by Anzu, a relative of said dinosaur. Anzu is often referred to as The Chicken from Hell". The effect, "If this card is Normal or Special Summoned: You can take 1 Dinosaur-Type monster from your Deck, and either add it to your hand or send it to the Graveyard. ", does not target a Dinosaur-Type monster in the Deck. You choose to either add a Dinosaur-Type monster from your Deck to your hand or send a Dinosaur-Type monster from your Deck to the Graveyard, at the time of activation. The effect, "You can target 1 other Level 4 or lower Dinosaur-Type monster on the field; destroy it, then Special Summon 1 Dinosaur-Type monster from your Graveyard in Defense Position. ", is an Ignition Effect that can target 1 Level 4 or lower Dinosaur-Type monster on your field or your opponent's field. 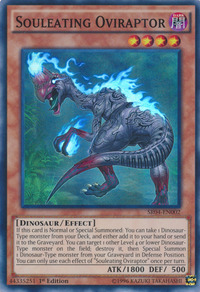 The resolution of "You can target 1 other Level 4 or lower Dinosaur-Type monster on the field; destroy it" and the resolution of "then Special Summon 1 Dinosaur-Type monster from your Graveyard. ", is not considered to be happening at the same time. The effect, "You can target 1 other Level 4 or lower Dinosaur-Type monster on the field; destroy it, then Special Summon 1 Dinosaur-Type monster from your Graveyard in Defense Position. ", cannot be activated if there are no Dinosaur-Type monsters in your Graveyard. If "Vanity's Emptiness" is being activated in a Chain, to "Souleating Oviraptor", targeting "Megalosmasher X", the resolution of "You can target 1 other Level 4 or lower Dinosaur-Type monster on the field; destroy it" is applied, but the resolution of "then Special Summon 1 Dinosaur-Type monster from your Graveyard in Defense Position. "is not applied. "Megalosmasher X", which was the targeted monster, will be destroyed by the effect of "Souleating Oviraptor". : If "Vanity's Emptiness is chained to the effect of Souleating Oviraptor, how does the effect Souleating Oviraptor resolve?